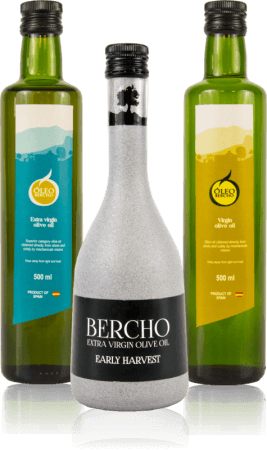 A bright and thick oil from the Bercho area in Pegalajar (Jaén). The most tradicional olive oil in the mediterranean culture. Medium intensity and golden-green hue. Without chemical additives, only through mechanical procedures. Use a variety of Picual olive. This olive oil is the winner of numerous awards like most healthy product, among them the silver medal as the healthiest oil in the world at the 2017 World Best Healthy Award. An olive oil obtained with half-ripened olives harvested between the months of November and January. the result is and medium intensity which compliment without lost savour. Although the Extra Virgin Olive Oil can be consumed raw, in addition will give the best results in the preparation of roasted meats and baked fish. The sauces and cold cream are other perfect options for use this type of olive oil due to provide an extra flavor and enhace the characteristics and properties of the rest ingredients.